The Runes have been used since Viking times, as magical tools and a system for divination similar to the Tarot or to the I-Ching. By learning the nature of the runic symbols one can reflect upon the nature of being. 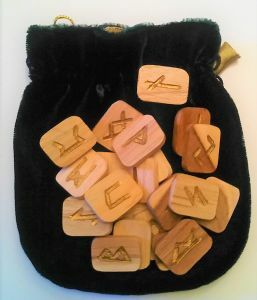 TheVikings believed the Runes held the Meaning of Life in their symbolism, and casting the Runes is a positive way to gain insight and wisdom into your own or another's personal life, events & developments. The Runes make a powerful psychic link with your inner awareness and can illuminate your path towards growth and fulfillment.